The Quechua people group are made up of many formerly different indigenous South American tribes, and live throughout the Andes Mountains. As direct descendants of the ancient Inca empire, they trace their roots back to the language and culture of the area in and around the city of Cuzco, Peru. When Spanish explorers arrived centuries ago, they found a well developed society which had influenced other tribes of Bolivia, Ecuador, Chile, and as far as northern Argentina. The Quechua tribes, and the other tribes whom they conquered, had together become the most powerful and widespread group in South America. Quechua was the language of the “Inca” people, consisting of many different dialects as the language mixed with the local tribal dialects throughout the Andes Mountains of South America. The Quechua language prevails today and is spoken by several million people in Peru, Bolivia, Ecuador, Chile, and northwest Argentina. In 1975, it was recognized by the government as one of the three official languages in Peru, along with Spanish and Aymara. Quechuan culture was one of the most advanced in the western hemisphere before the coming of Spanish conquerors in the 16th Century. Artistic styles from other cultures of the area have influenced the Quechuans, originating from the pre-Incan cultures of the Aymara, Nazca, Wari, and Yunca peoples. 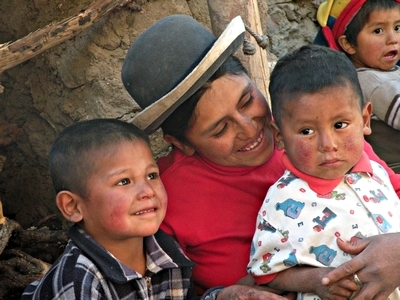 Rural Quechuan communities of the past centered around the family and community. Today, individuals may own livestock or land personally, but continue to farm the land together in order to provide hand labor for plowing and planting the remote, rugged, and difficult terrain. Forming work groups called “Ay-nee”, they depend upon the community organizing work days for plowing and planting and other community development projects. Within more remote mountain villages, most couples’ marriages are still arranged with the consent of the parents and the approval of the community. Men and women are not considered adults until they are married. Their beliefs of reality are influenced by animism and concern with appeasing “mother earth” and other gods of the mountains, water, and of the harvest. They believe that punishments come from these spirits and gods, in the form of calamity, accidents, bad luck, sickness, and bad weather. Archeological research demonstrates evidence of former human sacrifices in this area. While building a new house, it is still a common practice to place a dead llama fetus in the foundation or wall to appease “mother earth”. It is believed that the soil and rocks have spiritual and physical life and power in them, and when offended, will punish those who do not “pay back” the spirits. Alcoholism is an innate part of the rural Quechuan culture. Work, social events, and family gatherings are centered around drunkenness, with corn beer (chee-cha) and cheaply purchased methanol consumed by old and young. The individual who desires to leave the alcoholism while remaining a part of the interdependent community finds intense social pressure to continue participating in the drunkenness, which is very central to the social structure. Family units are usually malfunctioning and fractured with many children suffering neglect and abandonment. The historical achievements of the Quechuan culture of the past are appreciated and valued, which helps to encourage social structures. However, the sin and ignorance of God’s ways are destroying these people. The readily visible consequences of sin result in dysfunctional relationships, broken families and poverty. Throughout the culture, dishonesty is very much accepted as a normal part of relationships and business, and this stifles economic growth and prosperity from simple agreements for domestic services to international trade and business development. Only God can change hearts and minds to overcome these challenges. There are great needs for gospel workers in Peru. Most Peruvians continue to live without a clear proclamation and witness of the Gospel of Jesus Christ. In remote areas, many groups and tribes have no Bible believing churches, and some are entirely unreached with the Gospel. When we first arrived in 2000, we found the Quechua people group of the Cotahuasi Canyon with only a scattered few believers who needed evangelizing, discipleship, support, and training to reach their people and plant Bible believing churches. Most have not clearly heard the true biblical Gospel, but are syncretizing their understanding with mysticism, animism, witchcraft, cults, and aberrant religions. Various religious cults confuse and compromise what Bible truth they may have heard or read. In the cities, most recent religious movements are not Bible-centered, but are preoccupied in manipulative mysticism for the purpose of personal, temporal, and material benefit. The team of workers here in the Cotahuasi Canyon desires to live out the love of Christ among the Quechua by faithfully proclaiming God’s Word, drawing believers together into churches, training church planters, and discipling believers toward effectively living in holiness for Christ’s glory. We are deliberately Scripture-centered with the purpose of glorifying Jesus Christ, rather than man. We are dedicated to faithfully proclaiming the truth of God’s Word, the Bible, and we rely upon Scripture’s inerrancy, trustworthiness, sufficiency, and authority in order to teach the true gospel and make disciples. The Cotahuasi Canyon area is considered one of the poorest of Peru. Some people have running water to their homes, but many still cook over three stone open fires, and most have dirt floors in their houses. A day of hard farm work often receives a pay of about $7 to $9. Many people simply eat what they can grow in their own small fields. Some leave their remote villages to work in other areas of Peru for awhile and are able to send money back to their families. But these people usually have a difficult time getting a good job and seldom are they treated or paid very well. Portions of the Bible have been translated into the Quechua language since 1907. In 1985, the New Testament translation was completed in the Cuzco dialect, and 1993, a translation of the entire Quechua Bible was printed. 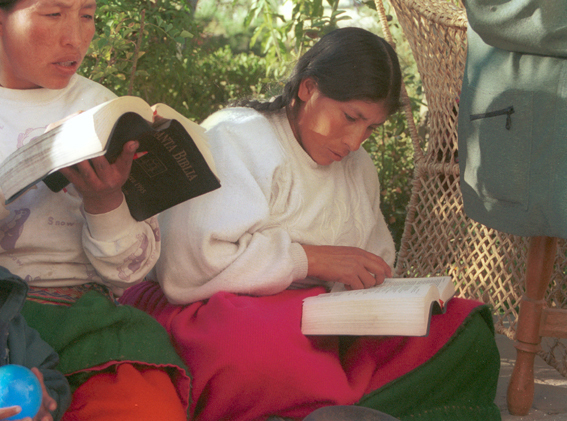 Other Quechua dialects now have the entire Bible, and many others recently or currently are acquiring New Testament texts, thanks to the difficult work of Bible translators. 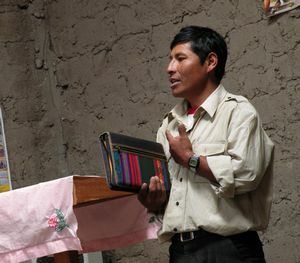 In 2015 a New Testament translation for a neighboring Quechua people group was made available to us, and this has helped new Christians understand the scriptures. In the La Union Quechua dialect, we have Acts and Luke completed through the efforts of Wycliffe Bible translators, and further translation of New Testament books is currently being considered. Various Spanish translations are currently available. Please pray with us for the establishment of Biblically-faithful and mature churches throughout the canyon area of Cotahuasi.